UNEX Manufacturing, Inc., the trusted industry leader in providing innovative order picking solutions, introduces the UNEX Configurator, an easy-to-use design tool that generates a 3D image and bill of materials for users’ custom carton flow solutions. The online Configurator quickly and easily lets users configure a Span-Track solution from the ground up by themselves, accelerating the turn-around time for custom-fit materials handling equipment that can speed fulfillment and throughput in the warehouse, distribution center or manufacturing line. 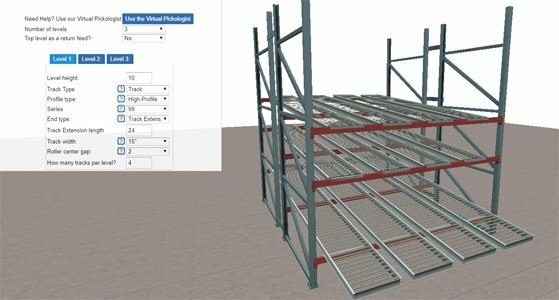 Users begin to create their designs with the UNEX Configurator by inputting the dimensions to match their existing racks, along with the name of the pallet rack beam manufacturer and type of upright needed. Next, the number of levels, types of rack and end-style are added to fill the racks. Users simply click on “send me my design” to receive their free 3D image with a bill of materials included. UNEX can generate a quote based on the design. Other products, besides Span-Track, will be added to the Configurator in the future for even more custom designs. UNEX Span-Track is a patented carton flow solution for full case and split case (each) order picking. Span-Track easily drops into existing structures and creates the ultimate carton flow rack roller system, keeping product at the pick point for the worker. Span-Track increase warehouse utilization by 50%, reduces carton imprints with 300% more surface area than other roller track options, and increases throughput up to 150% when compared to order picking from pallets. To access the UNEX online configurator and get started with a custom Span-Track design, click here.